In the Highest Degree Odious: Detention without Trial in Wartime Britain. A.W. Simpson. Clarendon Press. 1984. The author, who passed away in 2011 was a lawyer, British legal historian, author and professor of law. In this particular book, he delved into the detention of British citizens during World War 2. In May 1940, the German Army launched an offensive against the Low Countries and France. The speed of their advance was incomprehensible to the Allies and led to the belief that a Fifth Column must have been at work in the Low Countries. With most of Continental Europe firmly under the jackboot of the Germans, England felt backed into a corner and looked to uncover an Fifth Columnists and spies within the island kingdom. The Security Service, underfunded during the interwar period, fueled the paranoia and portrayed the threat as greater than it probably was. 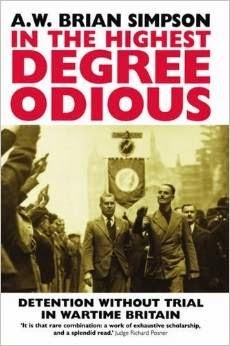 Jewish refugees, enemy aliens, British citizens of German or Italian extraction, Communists, members of the British Union of Fascists - all came under suspicion and a wave of internments followed. At the start of the war, the British Government had passed the Defence Regulations, of which #18B gave the executive the right to detain British citizens. Herbert Morrison, an MP for the Labour Party noted that the regulation gave the executive "really extraordinary sweeping powers under which, it seems to me, anybody whom the Home Secretary did not like could be hanged, drawn or quartered, almost without any reasonable or proper means of defending himself". The author noted that there was a huge difference between imprisonment for a criminal offence (where guilt has been established through a public trial) and imprisonment by executive decision. He noted that "once government is, for one reason, empowered to bypass the tedious requirements of the rule of law, and lock up its citizens without charge, trial, or term set, the temptation to extend the use of so convenient a power seems to be quite irresistible - the threat to liberty comes not from some malevolent enthusiasm for tyranny, but from a professional concern for efficient government". Whitehall, with the legacy of World War I still fresh in its memory, felt that war could only be carried on under conditions in which civil liberty had, as a matter of law, been abolished. The powers granted to the government were incompatible with a democratic state and the "legal regime under which Britain fought the war was that of a totalitarian state". In mid-1940, citizens, refugees, enemy aliens and political opponents were arrested without warning and imprisoned without trial. Some were held at special interrogation centres (Camp 020 being one of them) where they were subjected to various forms of what we would now term psychological torture. By 1941, Churchill began to have doubts about detention without trial, recognizing that the Fifth Column was a myth. Some detainees were eventually released, many remained interned for the duration of the war. In this book, the author has touched on an issue that is extremely relevant given society's current concern with home-grown terror networks. The history of Britain's Defence Regulation 18B illustrates a problem that faces liberal democracies in times of grave crisis and raises an interesting question. Is it essential to their survival that they should temporarily cease to be liberal democracies until the threat is over? The danger is particularly acute when it comes from an illiberal enemy. Apparently "when the security of the state, and the very survival of British liberty, is at stake, the rights and interests of individuals simply have to go by the board". Or, as someone else put it, "War is a rough business; you cannot make omelets without breaking eggs". The author leaves us with this warning - "It is wise to be extremely skeptical when security services, or indeed anyone else, puts forward the claim that drastic action needs to be taken against an enemy within. You can never really trust security services. They are in the business of constructing threats to security, and the weaker the evidence, the more sinister the threat is thought to be." The British government was ruthless in its handling of German spies. It was extremely revealing to learn that the British government was equally ruthless in how it dealt with its own citizens. When faced with a dire threat, a government can lay democracy aside, without the consent, or even the awareness of its citizens. A scary thought. Or as Churchill said: "In the highest degree odious".